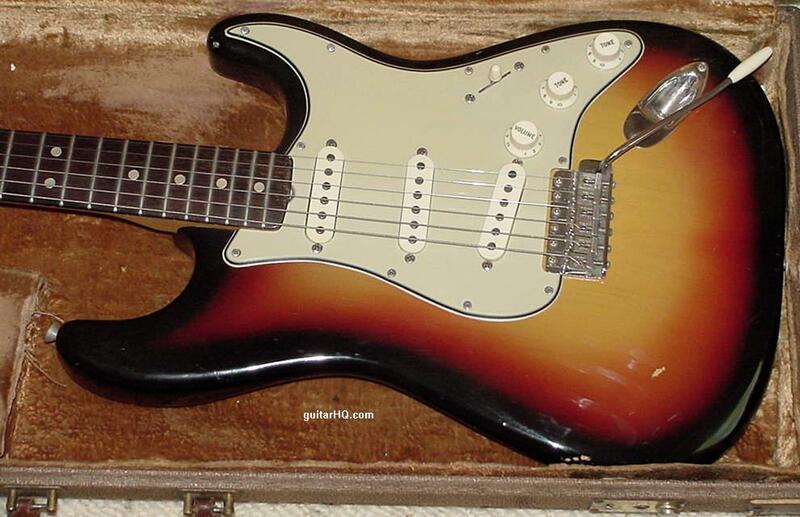 1964 and 1965 brought a number of changes to the Fender Stratocaster (and none of them good). By mid-1964, the peghead "Fender" logo changed from the petite (and rather cute) thin "spaghetti" logo to a more bold "transition" logo. 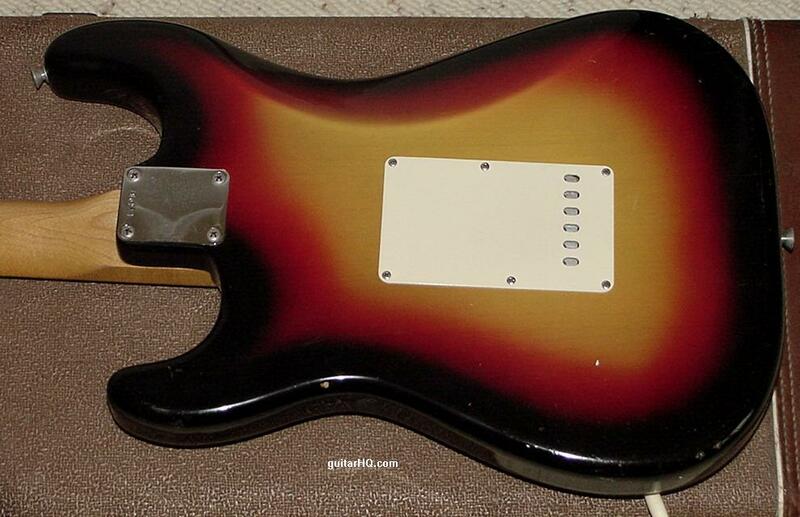 The finishing procedure also changed for the Stratocaster at about the same time, allowing Fender to use body wood of lesser visual quality (and also making the sunburst finish look less appealing). By the fall of 1964 "clay" fingerboard dots where changed to Pearloid (a plastic that looks like pearl), and late 1964/early 1965 brought a change in pickguard material from the mint-green celluloid to a more stark white ABS plastic. 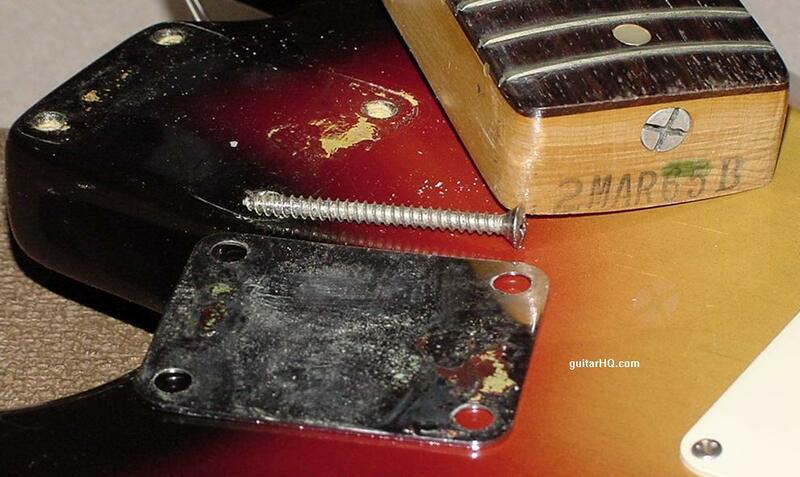 Other minor changes ensued, all to make the production of the Fender Stratocaster quicker (cheaper). 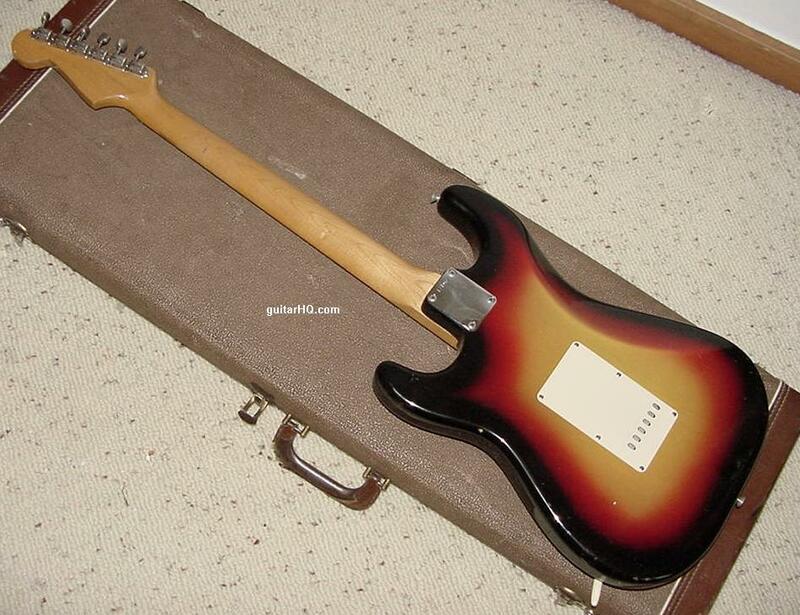 By December 1965 Fender also changed from the "L-series" serial number format on the neck plate to a "F-series" (there was now a large script "F" stamped into the metal neck plate). 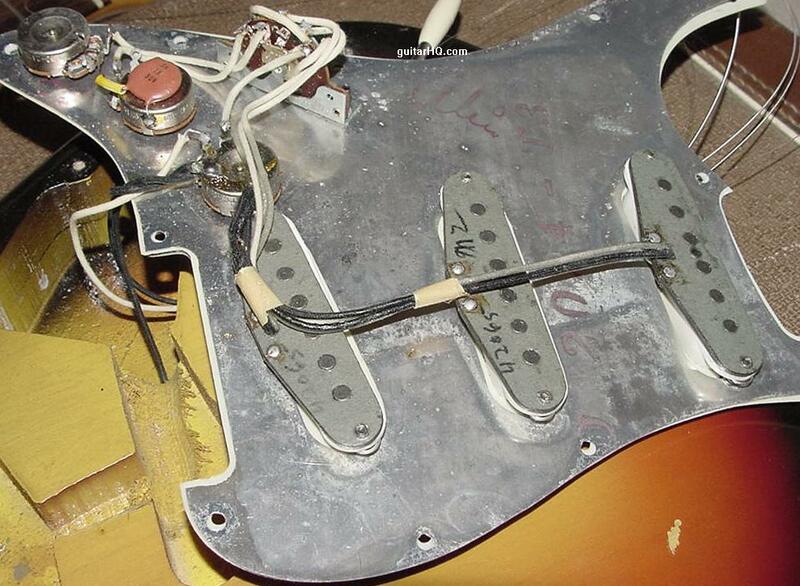 This change, and the enlargement of the Strat's peghead signify the end of the "pre-CBS" Fender Stratocaster (hence large peghead 1966 Fender Stratocasters are not considered pre-CBS models). 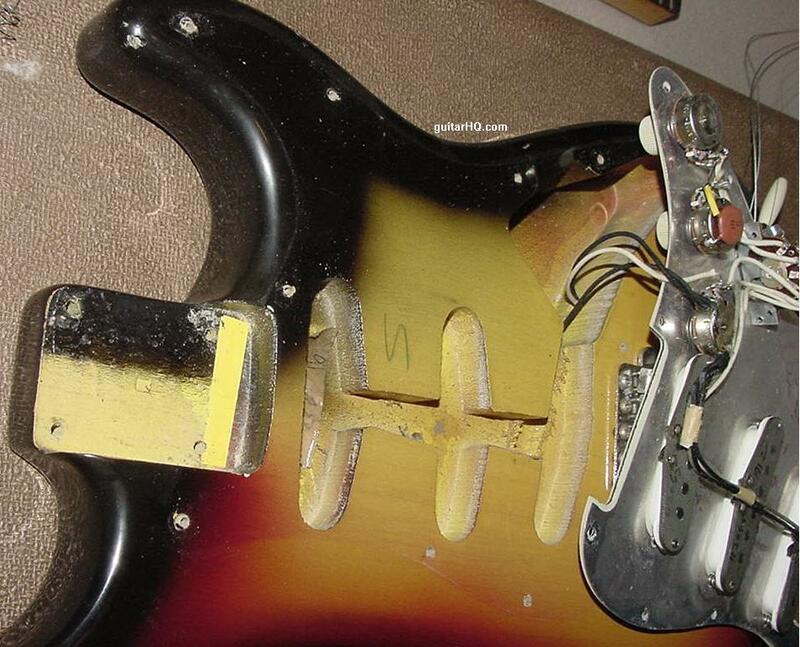 Serial number range for the 64 Fender Stratocaster are generally L20000 to L55000 (on the neck plate). 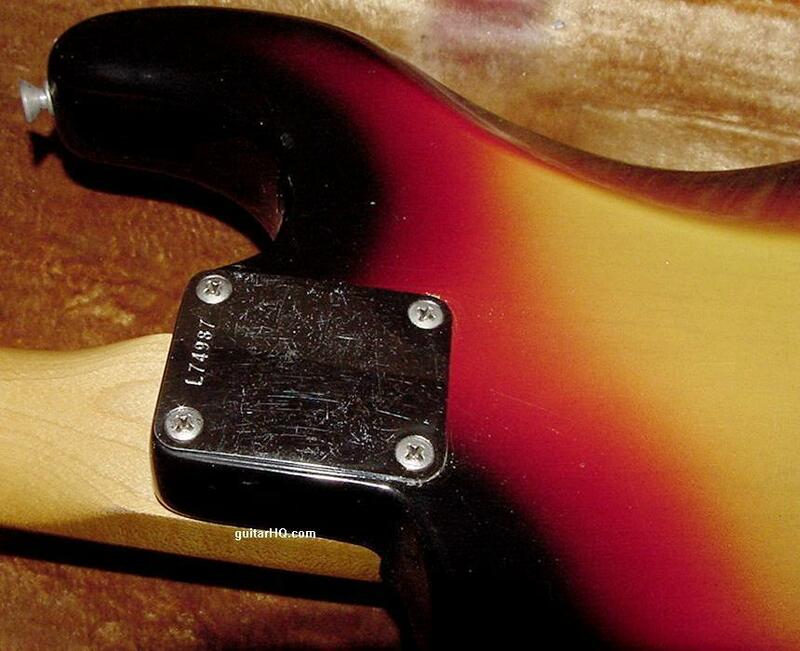 Serial number range for the 65 Fender Stratocaster are generally L55000 to L99999 (on the neck plate). If you need to figure out the exact year of your pre-CBS Fender Stratocaster, use the serial number and the general features of the guitar. The serial number is located on the back metal neck plate. See the Fender Serial Number Info web page for help determining the year. 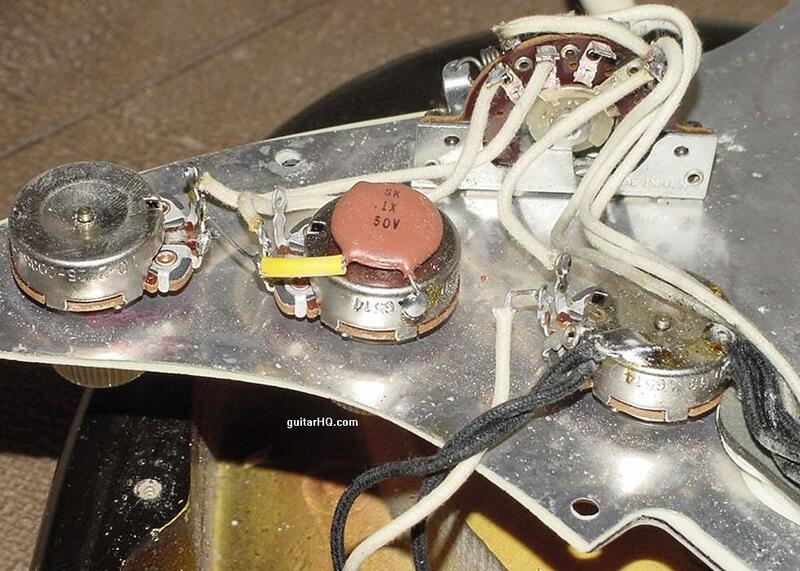 See the previous year's 1963 Fender Stratocaster guitar. See the next year's 1966 Fender Stratocaster guitar. A gold Fender peghead decal thicker than previous "spaghetti" logo. This is known as the "transition" Strat logo. Now has 4 patent numbers (3,143,028 added). The finish on the sunburst changes (especially the yellow, which is now sprayed in addition to the yellow body dye, and is far less translucent). See the Fender Colors article for more details. Sunburst finish has a more "target" look with a more dramatic change of the three colors, with less blending between colors. About 12/64 the "nail holes" are no longer present under the pickguard. Pearloid fingerboard dots replace "clay" dots. This transitions in with the 1/4" fingerboard dots converting to pearl first, followed by the smaller side dots becoming pearloid. Plastic white three layer pickguard replaces the "mint green" celluloid (this happens about 12/64 to 3/65, though early style mint green celluloid pickguards can be found on some Strats throughout 1965). Contouring of the body is even less dramatic, especially at the right forearm. Pickups change from "black bottom" to "gray bottoms". Dates are often seen on the bottom of the gray pickups in either a black hand-written pen, or in a yellow ink stamp. The metal spacer below the butterfly string tree was replaced with a white plastic spacer. Peghead Fender decal has 4 patent numbers (2,573,254 & 2,741,146 & 2,960,900 & 3,143,028). 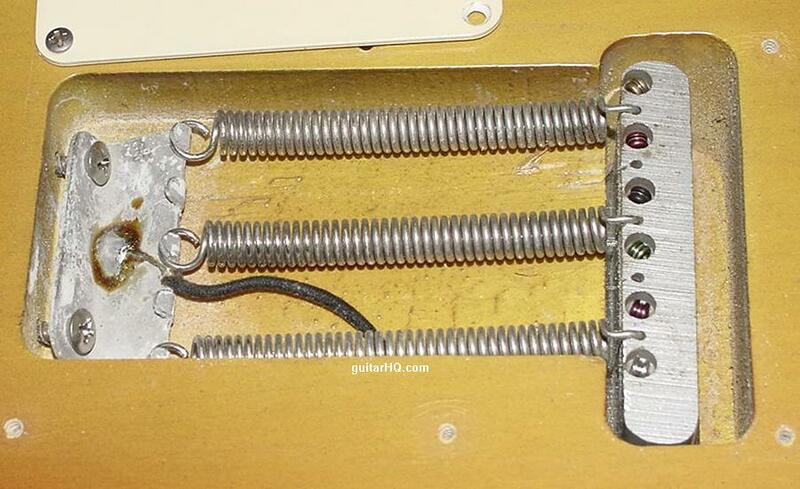 Peghead design enlarged significantly about 12/65 (known as the "large peghead" Strat). Maple fingerboard optional (2 piece neck, no "skunk stripe"). Often the "film" of the peghead "Fender Stratocaster" decal is much larger. This large film decal only lasted a month or two, around 12/65. After serial number L99999, the serial number plate now has a large script "F" (known as a "F plate"). The serial number starts at 100000 but with no preceeding "L". 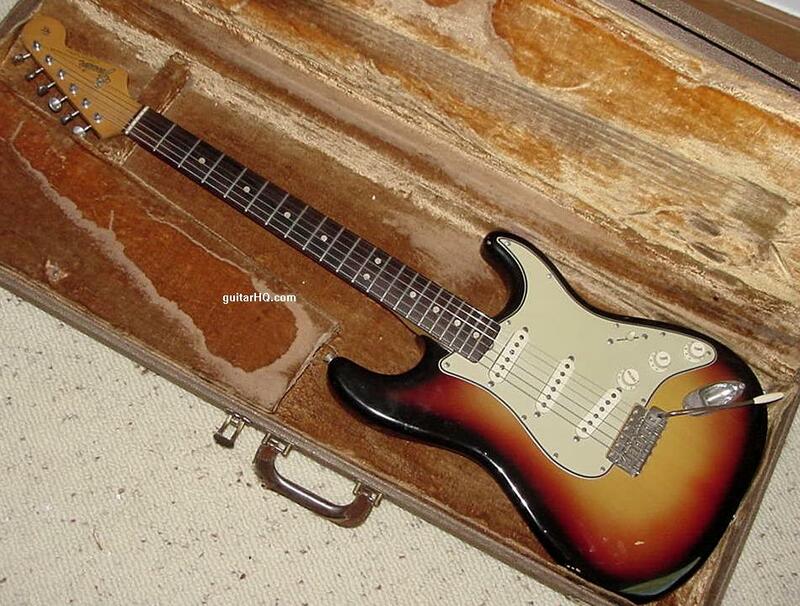 An early 1965 Fender Stratocaster guitar with a non-original case (this is a 1961 style case). This 1965 Strat has the old style cellulose mint-green pickguard. Neck dated March 1965. A pot date code of 6514 can be seen on the middle pot (14th week of 1965).